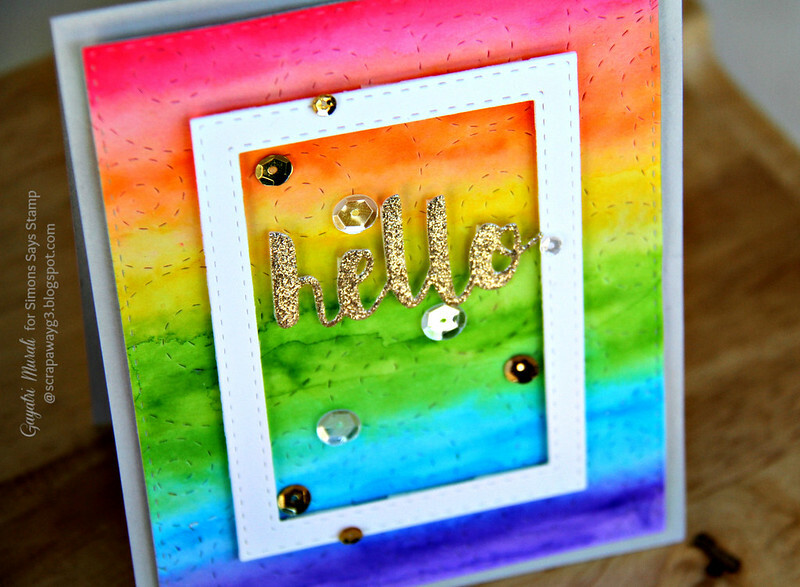 Simon Says Stamp DieCember card – Hello! Happy Sunday! Hope you are all enjoying your weekend. I am sharing a card using Simon Says Stamp DieCember release die called Stitched Whirl. This die has beautiful stitched swirls which gives the background subtle details. Love it. I wanted to add more to just die cutting using the Stitched Whirl die. I wanted those swirls to be highlighted. So I die cut using watercolour paper and then did a rainbow colour on the die cut. Once dry, I die cut using the largest Stitched Rectangle die from Simon Says Stamp. Love the stitched details on the panel and the bright rainbow colours. To keep the background panel to be highlight of the card, I kept the sentiment simple by die cutting Simon Says Stamp Painted Hello in gold glitter cardstock. But the sentiment die cut was a tad small for the rainbow panel. So I decided to frame the sentiment by die cutting a white stitched frame using two Stitched Rectangle die from Simon Says Stamp Stitched Rectangle die set. All the layers are adhered over a Fog card base using foam adhesives for dimension. Finally brought the card together with Pretty Pink Posh’s 10mm and 4mm Sparkly Clear and 6mm and 4mm Gold sequins. 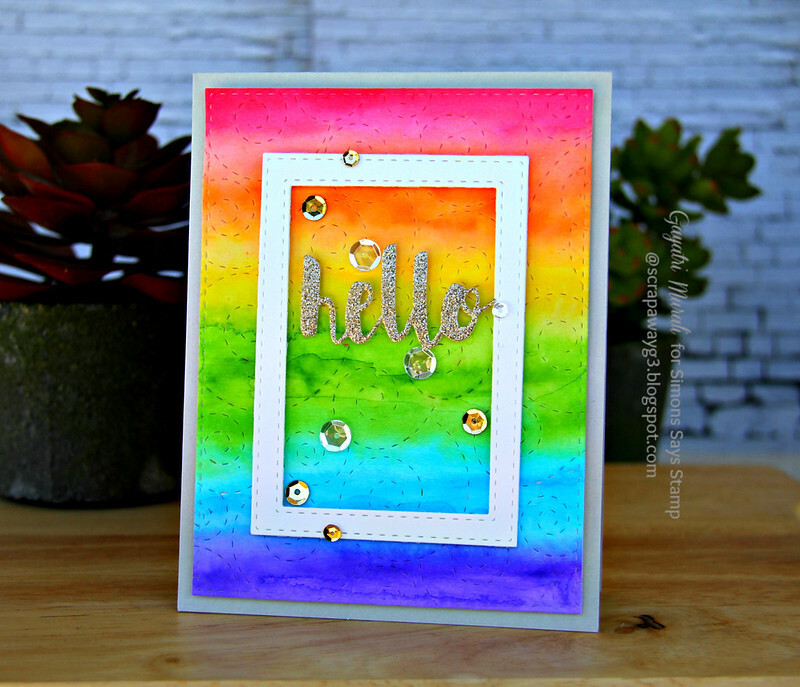 Here are some side shots of the card which shows the stitched swirls on the rainbow panel. All the new DiCember dies are available for purchase at Simon Says Stamp Store. You also get a free wafer die this month with the purchase. The code is WAFERDIE. Thanks for stopping by my blog today. Have a lovely weekend. Love this Gayatri – it's absolutely stunning with that vibrant background.